Halifax trip – the foods! So, we had a really amazing time in Halifax – it was awesome to be away for a whole week, and see/try/do new stuff. Rather than put it all in one giant post, I’m going to break it down into a couple (a few?) to spread it out and to not have it be tl;dr. When you think about the Canadian Maritimes food-wise, it’s unfortunately mostly seafood. (Side note: having live and dead lobsters that you can buy and take on the plane home is grosssss.) I’m not into that, so I hunted out some vegan eats and was not disappointed! Go Halifax! Now please bring EnVie to Toronto kthx. Our first stop was the Board Room Game Cafe (OF COURSE), and because my friends who own/manage it know me so well, they immediately made sure I had delicious cider in my hands. 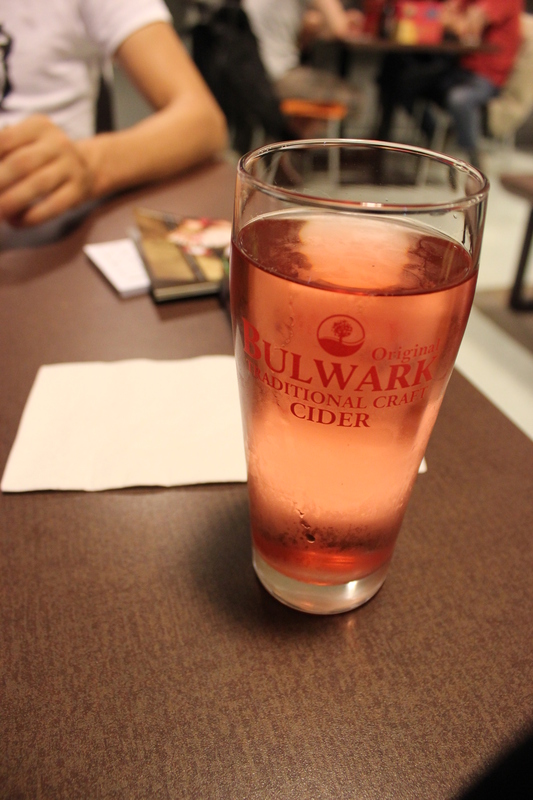 Bulwark is a Nova Scotian cider, and I think I had the blush one almost every day I was there. SO GOOD. I also tried the regular which was pretty good. As a pleasant surprise, the Board Room’s also pretty vegan friendly when it comes to snacking, not just drinking. Fruit bowl, tortilla chips & salsa, delicious popcorn (popped in coconut oil with vegan seasonings!) and the ‘Guac’ sandwich (which I paired with hummus & crudite as my side) means vegans won’t go hungry while gaming. Good for you, Board Room! 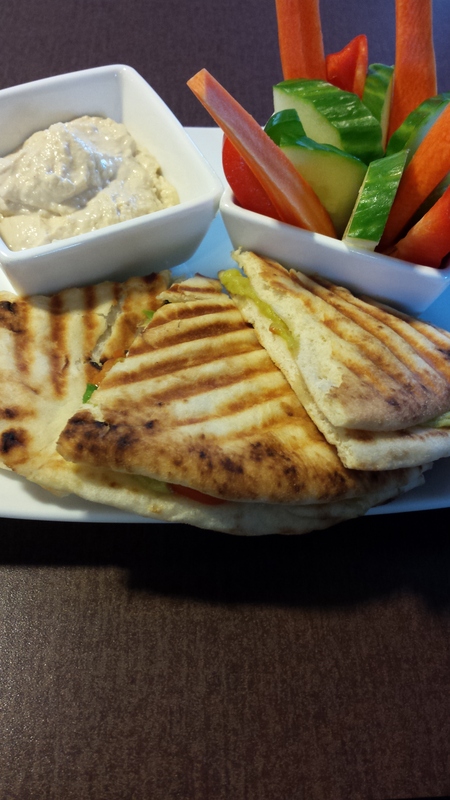 The Guac – grilled sandwich with a hummus/veg side at the Board Room Game Cafe, Halifax. 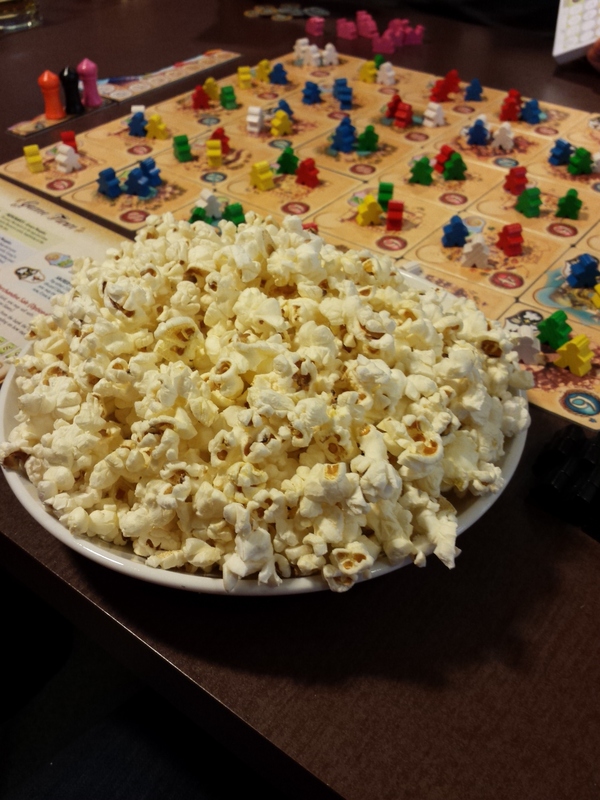 Popcorn bowl snack at the Board Room Game Cafe, Halifax! Our first full day we went with our friend Kris to enVie, a fully vegan restaurant cafe. It’s light and airy in there, and they have a small patio outside (but we chose inside as it was a wee bit cool). There’s a real emphasis on them creating stuff from whole foods in house (all their cheeses, for instance!) and sourcing ingredients from the local region. It’s all incredibly delicious – so flavourful! The menu’s a great mix of salads/healthy and comfort food. We went back when Liz & James were in town and I stuffed my face again, and wasn’t disappointed. 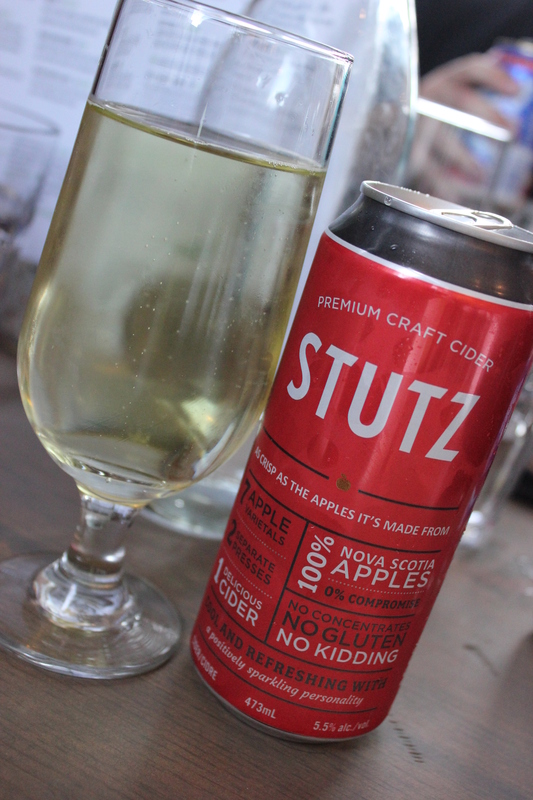 Plus, I tried another local cider which was really great, and had a very crisp flavour – Stutz. 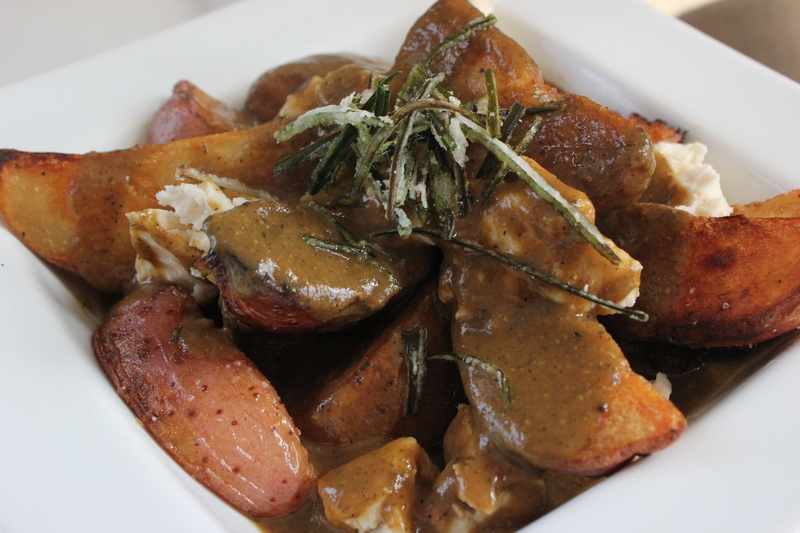 The enVie poutine – delicious wedges, incredible savoury gravy and amazing house-made ‘cheese’ curds. I want it always. The ‘Filet-o-Fresh’ sandwich, with a tofu pattie and strangely delicious butternut squash ‘cheese’ slice, and kale caesar (AMAZING) on the side. 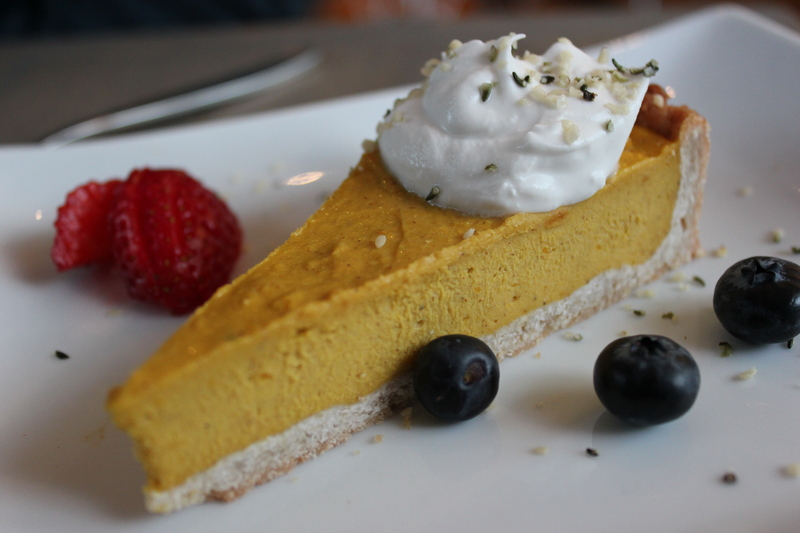 The Pumpkin Pie with whipped coconut cream at enVie. It was somewhat a hybrid of pie/cheesecake – a pastry base, but with a very firm topping. Anyhow, it was the most incredible pie, so who cares!! 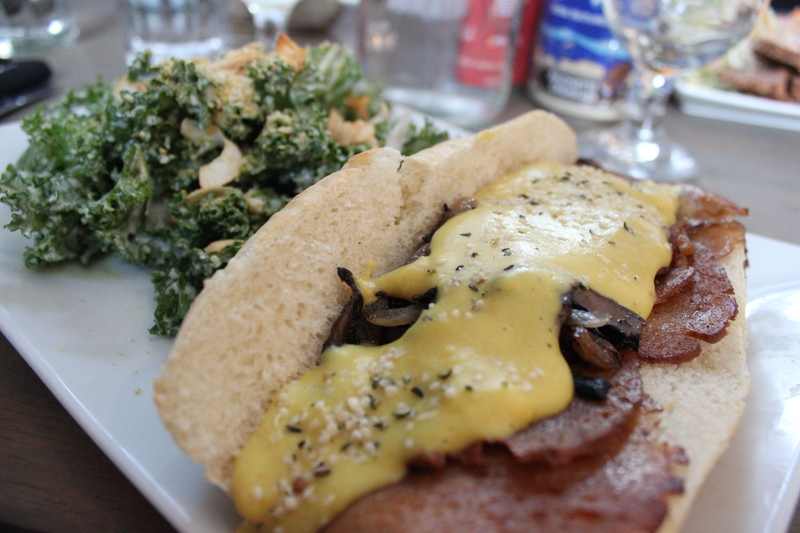 The Philly ‘Cheesesteak’ sammie with kale caesar side at enVie, Halifax. Absolutely amazing. Stutz Cider at enVie, Halifax. I’m pondering how one sandwich can be so amazing. Food daze. 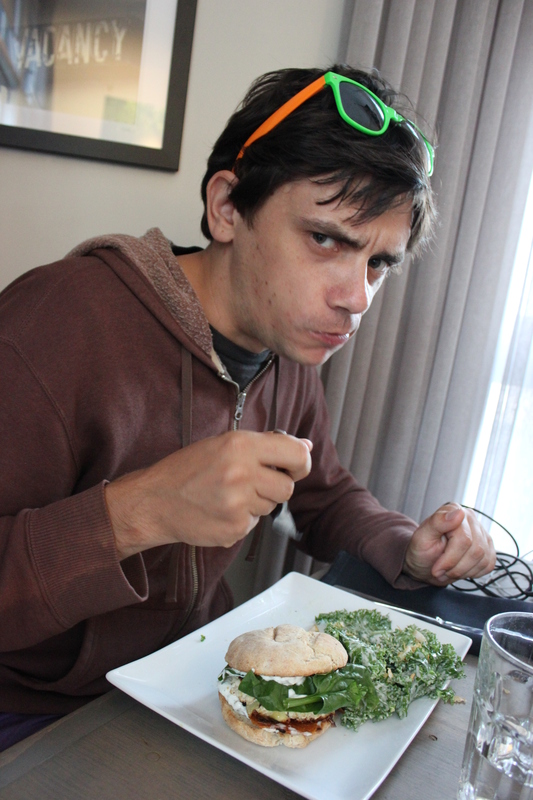 Adam is protective of his kale caesar side (he tried the GF version of the filet-o-fresh!). The Wooden Monkey is the most convenient spot for downtown vegan eats specifically marked as such on a menu. It’s a little pricey, as they source a lot of stuff very locally, but it wasn’t bad. I wouldn’t eat there regularly but it’s nice to know that option exists in the downtown area. 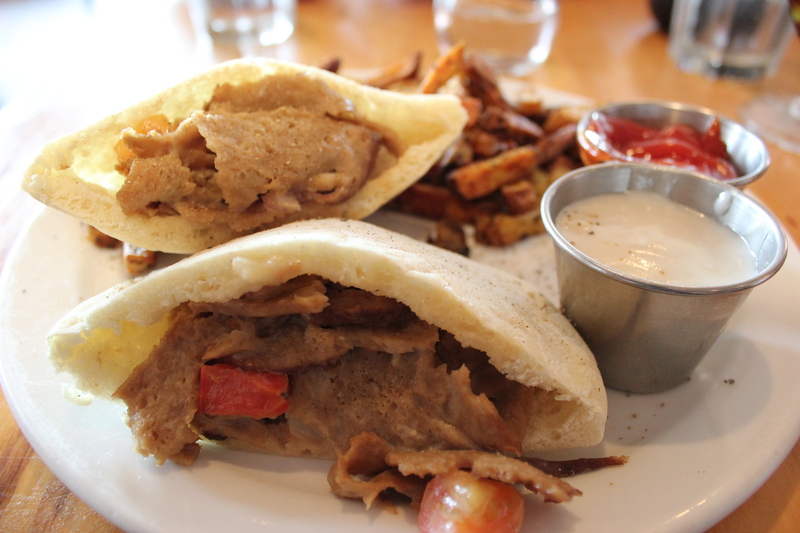 The Seitan Donair at the Wooden Monkey, Halifax. Around the area we were staying was the Wild Leek, a small 100% vegan cafe. 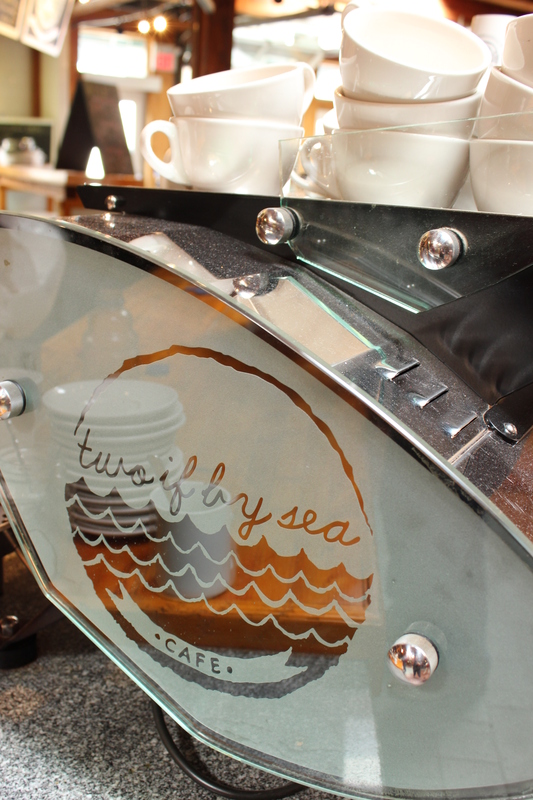 Charming, with a great menu, terrific smoothies and baked goods! (I had the best lemon poppyseed loaf i’ve ever tasted! Plus they have nanaimo!) We saw they had a brunch menu daily, so went in before heading out on a day trip with friends. Highly recommend this spot – tasty, cosy, with friendly staff. 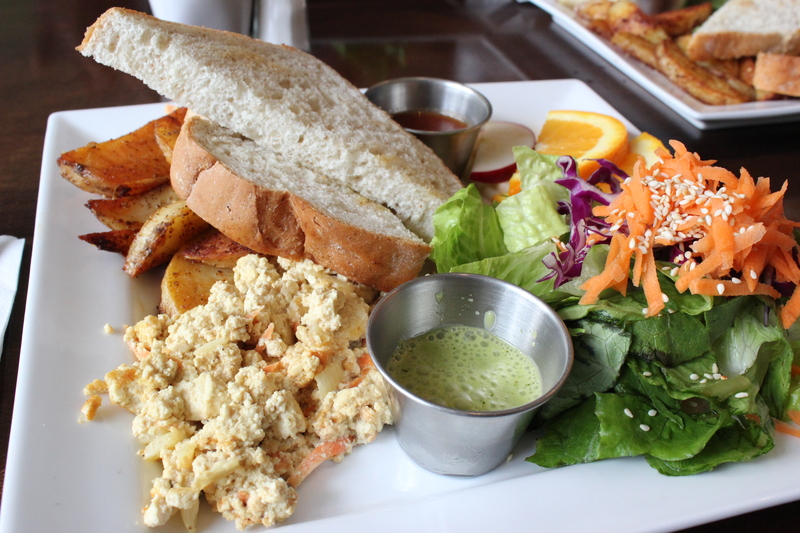 All day breakfast at the Wild Leek! Delicious tofu scramble, potatoes, bread & a side salad (I’m not sure about salad with breakfast, but it was tasty with the dressing). While out in the Annapolis Valley area of Nova Scotia, we stopped by the small town of Wolfville for a wander and a bite to eat. 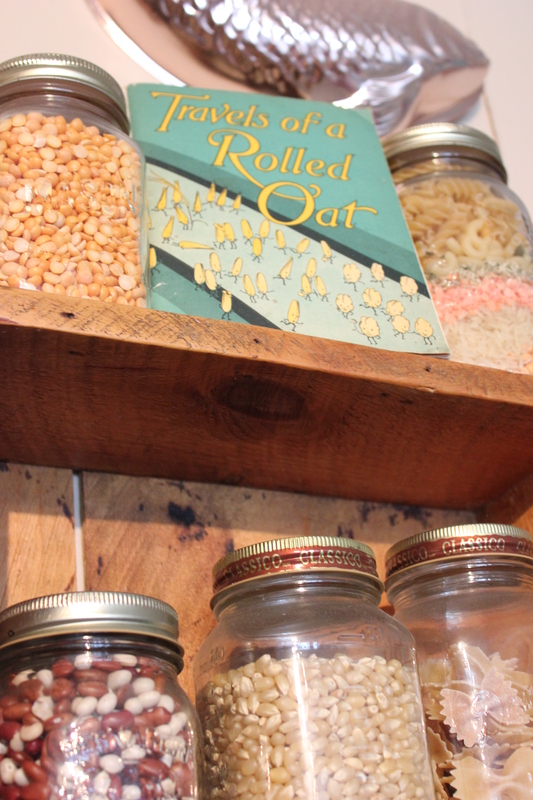 The Rolled Oat came up as somewhere that had listed vegan options, as well as a part of the menu for vegetarians and omnivores, so we all sat down for lunch. They have sandwiches and bowls and salads, plus some baked goods (a couple of vegan things there too!) I had a wrap – it was fresh, and filling but not super tasty (mostly bland, definitely needing hot sauce) – but a welcome change from just having to eat Vega bars while out for a day. Plus, it was a cute and quaint little place. 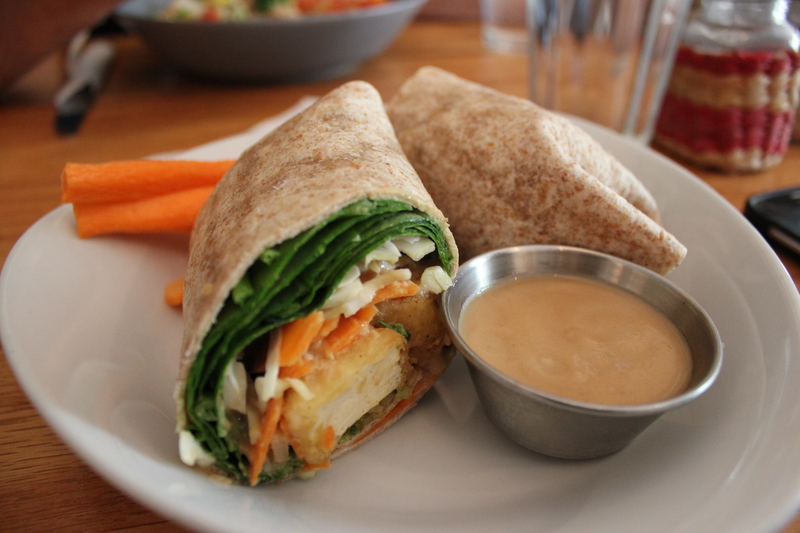 Peanut Tofu wrap at the Rolled Oat Cafe, Wolfville NS. Some of the stuff on the walls at the Rolled Oat Cafe, Wolfville, NS. On Saturdays, it’s the Halifax Seaport Farmer’s market – bustling with all sorts of vendors. There’s not loads of vegan options beyond the fruit & veg stands, some raw food stalls & a nut stand – but there’s a storefront that’s open other days as well as the Farmer’s Market days, called Fruition. Raw foods and snacks. Good stuff! I had a light lunch consisting of a raw burger wrap and a spicy thai salad. I also got a really tasty sundried tomato walnut pate to go, it was intensely flavourful! 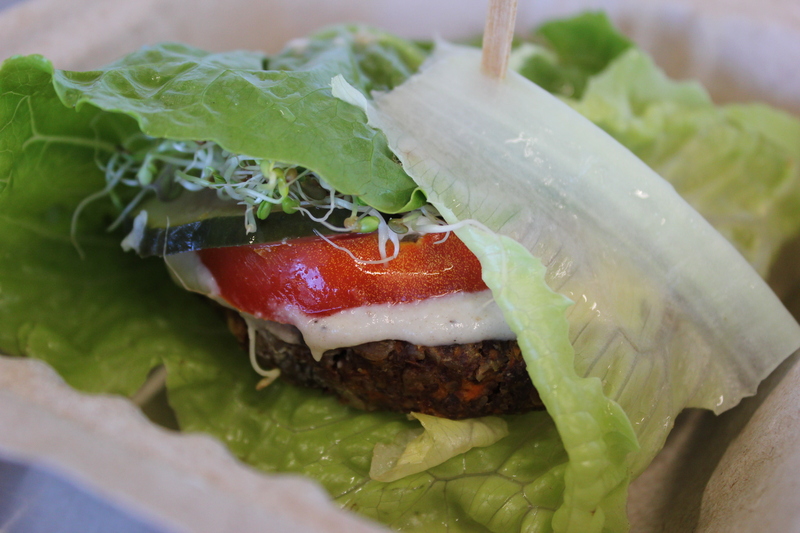 The raw Garden Burger at Fruition, Halifax. 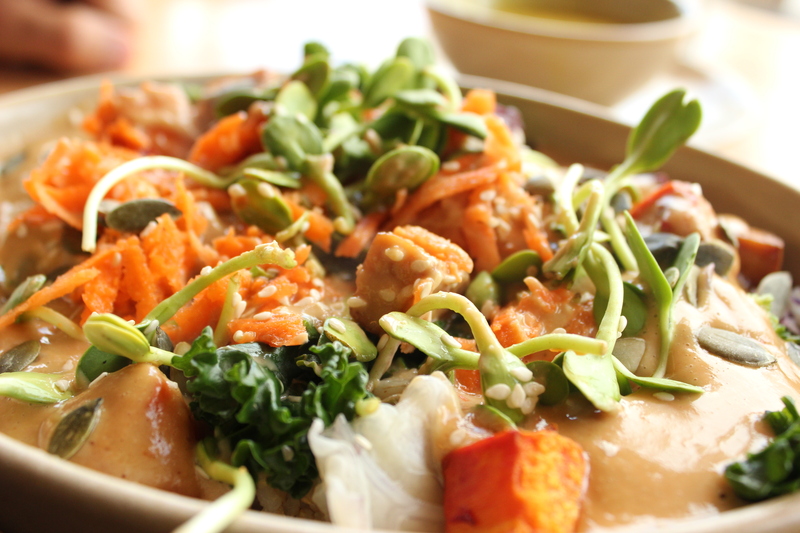 Tangy Thai salad (lots of zucchini noodles, carrots, sprouts) with a nice spicy dressing. Fruition, Halifax. 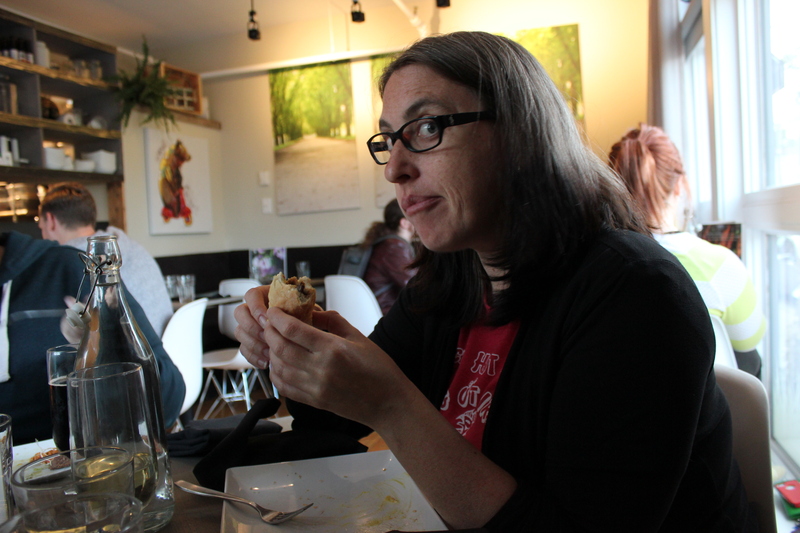 One afternoon for a late lunch we wandered to Heartwood, a cozy little spot on Quinpool. 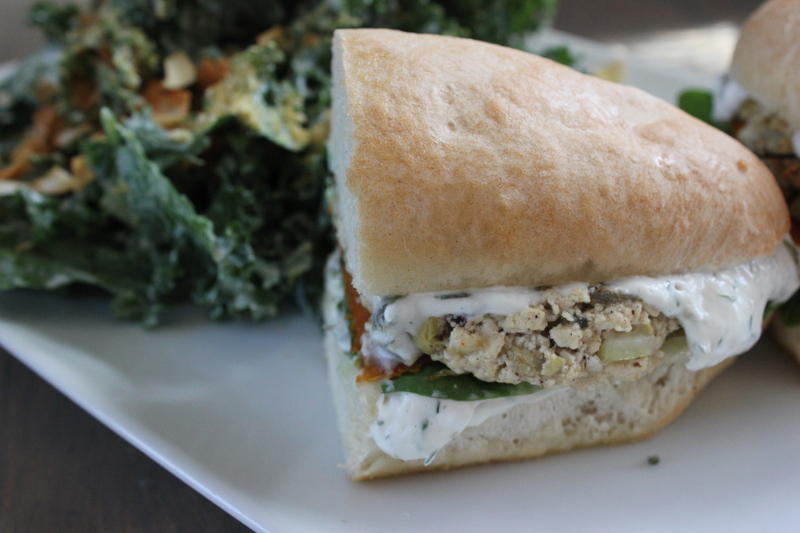 It’s a vegetarian cafe with a very vegan and gf-friendly menu. I also noticed after paying they had lots of little jars of cookies etc that were almost all vegan & gf – I wish I’d not been so full so I could have tried them, they looked great. (HUGE COOKIES!). 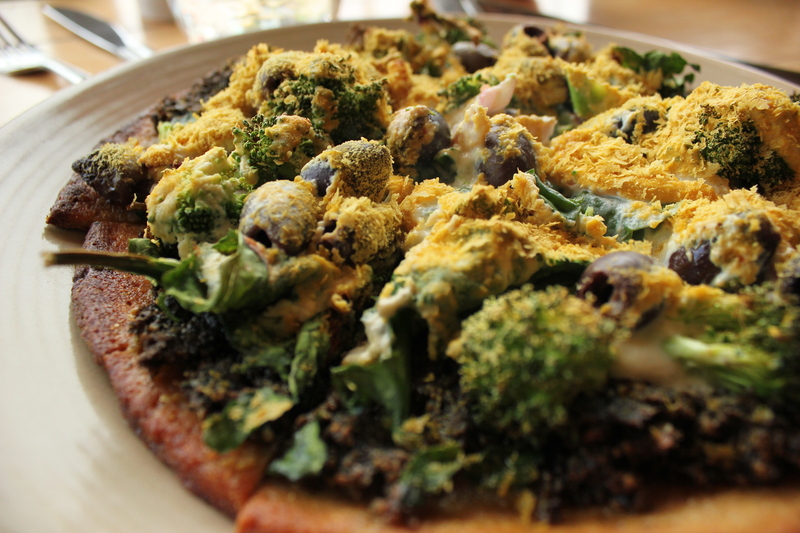 I’d been craving pizza, and gravitated toward something green with olives – I could’ve had it with Daiya, but chose to go with their house topping of a creamy dressing paired with generous nutritional yeast flakes. It was a GREAT and delicious topping. Mmmm. 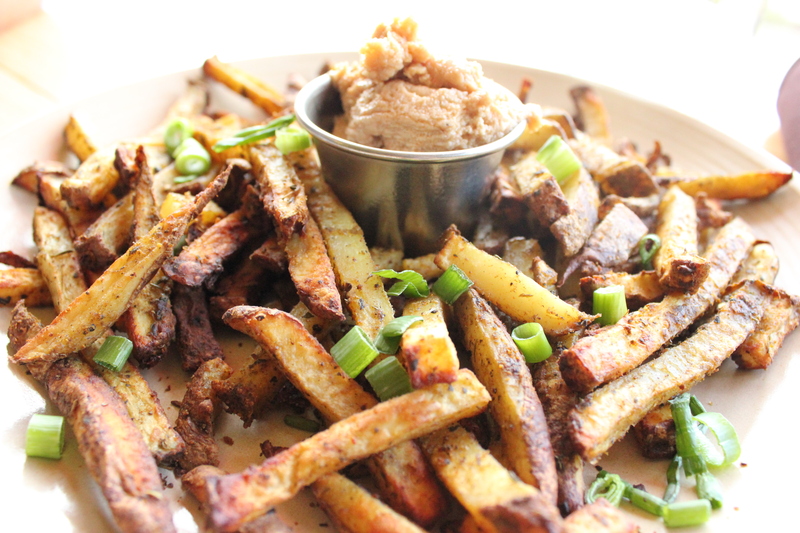 Heartwood’s herbed roasted fries with a chipotle cashew dip (they call it mayo, but it’s not that consistency). Adam’s spicy peanut Heartwood bowl. The Green Dream at Heartwood – spinach, broccoli, olives, onion, pesto, and the delicious vegan creamy dressing and nooch flakes! Mmmmm. We also found a couple of really nice local coffee spots – Two if By Sea (I had a great Anchored Americano) and the Smiling Goat (where I had a delicious Trifecta but the pic isn’t that wonderful). Enjoying a delicious iced Trifecta brew (Kilenso bean) at the waterfront Smiling Goat Espresso. Good stuff! 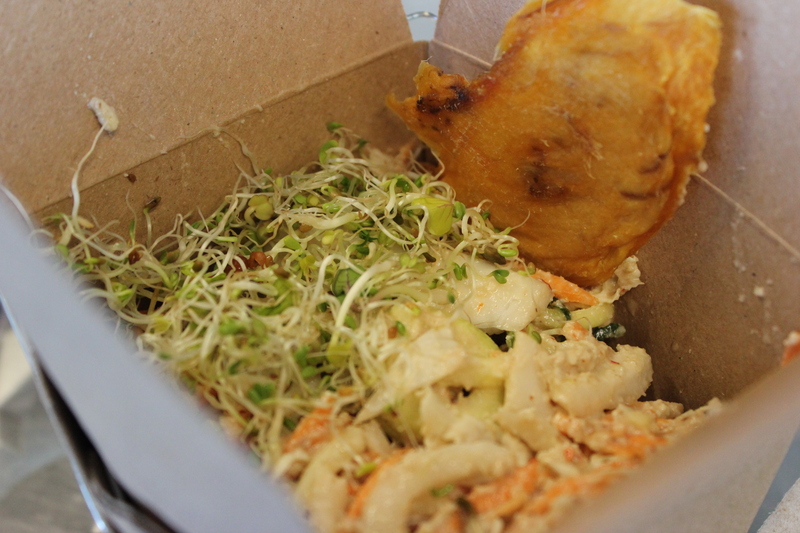 Overall I was really impressed by the food Halifax had to offer – two fully vegan cafe restaurants, a vegan raw takeout place at the Seaport, and a couple of other places with really solid vegan options. We also ate in a bunch with friends while in town, so we didn’t really explore the vegan options outside of the above. (The day we discovered $7 Daiya pizzas at Sobey’s was pretty sweet, and we had two BBQ nights of delicious Sol burgers and wonderful grilled veggies and corn, which was all fantastic!). I am still thinking about those sandwiches..